We have some exciting news to kick off the New Year: The World Business Academy is going live on local radio! Beginning Friday, January 11, we will begin broadcasting a new weekly radio talk show called “Solutions News.” Hosted by Rinaldo, each broadcast will feature a spirited and informative discussion concerning solutions to local, national and global problems. 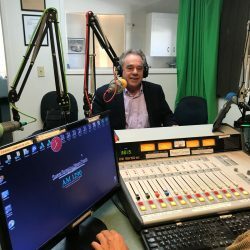 “Solutions News” will air live from 5-6 p.m. every Friday on KZSB 1290 AM radio, with replay broadcasts Fridays from 11 p.m.– 12 a.m., Saturdays from 5-6 p.m. and again on Sundays from 9 -10 a.m. Each show will also be available on demand as a podcast. Active listeners should also know that our regular monthly podcast, “New Business Paradigms”, will continue as usual. “Solutions News” will be additional content that adds a new perspective. “Solutions News” program content will offer listeners encouragement, optimism and strategies to solve the local, national and global challenges we face each day. We know that in our currently divisive, mean-spirited, regressive and chaotic political climate, many people have become disillusioned and cynical about the state of our nation, and the world. That needs to change, and we think a weekly dose of optimism is the best antidote to the pessimism that’s sweeping our nation. With accelerating climate change, continuing environmental destruction, bad economic news and the other challenges that confront us daily, we need to start sharing a weekly dose of what’s actually working, and the positive alternatives to the constant ‘doom & gloom’ delivered through traditional media. We believe people need to realize that there are solutions for every problem, and if we start examining and discussing these various solutions, a new optimism will emerge that will help us get through these dark times. “Solutions News” is our commitment to help our audience community see, experience and participate in what can work and what IS working. With today’s technology and resources, major challenges and problems can be solved if we collectively choose to be part of that solution. On each radio program, a wide range of issues will be addressed, including climate change, personal growth and development, solutions for the economy, and personal investing, just to name a few. We will also ask listeners to help us set the agenda by calling 805-564-1290 during the live broadcast (Fridays from 5-6 p.m.) to let us know of your interests or just to engage with the weekly guest. A new website featuring the weekly line-up can also be viewed at https://solutionsnews.org. The inaugural show on January 11th will introduce the program and feature a conversation with local environmental icon Marc McGinnes. Subsequent program guests will include visionaries such as Deepak Chopra, Jack Canfield, and other notable “solutions” thinkers and authors. Please tune in each Friday afternoon to hear, and weigh in on, the topics covered by Rinaldo and our esteemed guests. We’re certain you’ll come away with a more positive outlook that can be shared with others. Help us spread optimism and solutions by turning your radio dial to 1290 AM on Fridays at 5 p.m. and join the conversation.